This post will provide you the information on how to create kalamay with latik on top. In English, it is called sticky rice cake with a flavored sugar syrup on top. This dessert is mostly seen during baranggay fiestas and even during birthday parties. Kalamay or also spelled as Calamay refers to “sugar”. 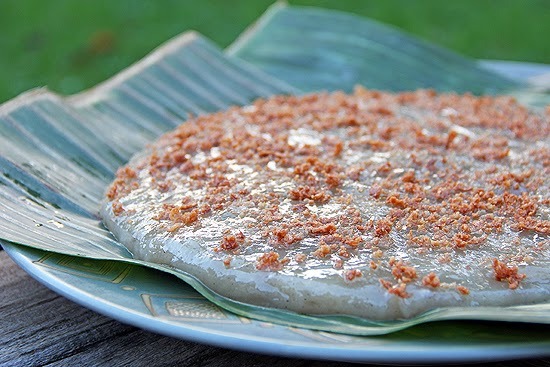 This yummy Filipino dessert is made up of ground glutinous rice, brown sugar and coconut milk. When you take a close look at it, it will seem like the popular Chinese Nian Gao or the tikoy however it is a bit more sweet and viscous. Each and every region in the Philippines have created their own version of this yummy dessert. However, Novo Ecijanos make their kalamay a bit differently, making the Nueva Ecija version stand above the rest. Making Kalamay the Nueva Ecija Style involves the use of syrup, jackfruit strips as well as latik. 1). Create the simple syrup first by mixing the sugar and water and bringing it into a boil. While it boils, add few pieces of jackfruit for flavor. Continue boiling until the mixture becomes thick. Set aside. 1). Prepare the latik by placing coconut milk over medium heat and allow it to boil. Continue boiling until the cream curdles and all the oil have came out. Stir moderately and wait for the color of the curdles to become dark brown. Drain the oil from the mixture and set the latik aside. 1.) Soak the rice flour in an adequate amount of water overnight. The next day, wash the flour well and drain out water. 2.) Add in the sugar, coconut milk and salt. Grind the mixture until it becomes smooth. 3.) Measure a cup of the resulting mixture. Boil some water and drop the mixture in it once it boils. 4.) Once the mixture floats from the boiling water, skim it. Set it aside and wait for it to cool down. 5.) Cut the boiled mixture into any size you desire. Nove Ecijanos tend to cut the mixture into small rectangles. 6.) Arrange it in a bowl. Pour over the simple syrup and the latik. Garnish with a few cubes or strips of Jackfruit or Langka. * If you do not have any langka on hand, you can use other fruits for flavoring. Highly recommended substitutes include lemon and pandan. * In cutting the boiled mixture, it is highly recommended that you make use of scissors rather than a knife as it is much easier to work with.